THE BIGGEST SPORTS DAY OF THE YEAR! A Unique Opportunity to Fill Your Bar or Restaurant from Morning until Night! 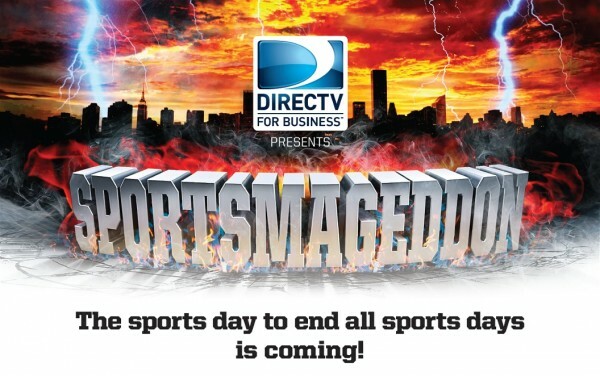 On May 2nd, DIRECTV will be celebrating SPORTSMAGEDDON – the sports day to end all sports days! DIRECTV for Business subscribers will be receiving a SPORTSMAGEDDON poster as well as a survivor’s guide to SPORTSMAGEDDON, which will arrive the week of April 20th. For a SPORTSMAGEDDON Survivor’s Guide, CLICK HERE. Dont Have DIRECTV for Business Yet? For a complete Sportsmageddon on DIRECTV Flyer, Click Here.